More and more I think the Vikings will look to move Waynes. They will need at least a high 3rd to consider it though, imo, so we will see what the rest of the NFL thinks of him. I agree. They drafted Hughes for a reason. They need Wayne's cap room, and he's gone after this year either way, so it makes sense to get something for him. He's also nearly always a step late when targeted and lacks the aggression to ever take the next step. His guy is never wide open, but he's also almost never really covered against an accurate QB. If they could flip him for a 2nd to be used on a starting Guard or a replacement for Barr or Rudolph that would be awesome value. That was Waynes two years ago. However, he's much improved now. He was an all around CB this year. Much better than Rhodes was. Rhodes has taken a step back. And if that continues next year and we let Waynes walk, we made a massive mistake IMO. Also, I dont think they drafted Hughes saying "yeah we'll let Waynes walk". He was BPA and there was the possibility of losing Waynes so they were covering their butts. I mean he allowed 1 TD all season this year. I'm not sure why anyone would complain about that. He was also 15th in yards allowed this year in the entire NFL. Nitpicking him "always being a step late" doesnt add up this year. I'd say that within his first two years but definitely not right now. If the guy can't cover who would trade for him? Waynes has improved each year and is still very young. Rhodes is the guy that needs to go. Too much TV time. He has already started his next career. But he's not worth much. I said the same about Hughes on another post. He was picked because they wanted him and needed him to help out. Waynes was excellent this year. And as for Rhodes....too much tv time? What? He’s actuallt a fairly quiet guy. Jalen Ramsey is a “too much tv time guy”. Not Rhodes first of all. I don't see the Vikings trading any of their defensive players. Cutting some, maybe, but trading, at least for anything that would have an immediate, material impact on the team heading into 2019, seems very unlikely to me. If there is a position on defense where Spielman is currently "rich" relative to the rest of the teams in the NFL, it's got to be cornerback. At the same time, successful teams don't trade guys in their primes. Maybe just past them, but not in them, and I thought Rhodes played pretty well this year. If they were to move Waynes via trade, I'd have to think the only sane reason to consider that would be his pending free agency coupled and the cost of extending him coupled with a lot of confidence that one or more of the younger guys on the roster can step into the role without missing much of a beat. Otherwise, I just don't see it. 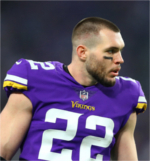 Spielman is much more likely to accept some cap casualty money for guys like Sendejo and Griffen and then apply that savings to the offensive line than thinking he's going to find real value in trade. He can always try, and maybe he'll get lucky. Antonio Brown was apparently at the Timberwolves game last night. How would everyone feel about trading Rhodes for Brown, with us possibly giving a late round pick too? Salary cap doesn't take a hit then, and we get a real playmaker, that allows Adam to go back to the slot where he belongs. I am over Rhodes doing his falling over act when he gets burned. I'd much rather have Waynes as our no.1 CB, and develop Hill, Hughes, Mack and possibly another through the draft. I say we trade Rhodes now regardless, before the rest of the league realises his problems, and his value goes down. Right now i reckon the league sees him as one of the top CB's in the NFL. And when he actually plays, he is. Antonio Brown is a cancer. Absolutely not. I thought I saw Rhodes on TV but I was wrong. I think the draft room guys saw a secondary that was destroyed in the playoffs and felt they needed to do something. I agree with that. You can't allow teams to pass at will. Yes they did shut out the Packers which was a great deal. And Hughes looks like a good player. He returned a pick for a TD which is a tremendous play. Unfortunately his future is cloudy because of a knee injury. He might never be the same which has happened before. Guys recover from ACLs way better now than they did 20 years ago. I think a main reason they got destroyed by Foles was because nobody thought he had the balls to throw the ball over 10 yards. He was overly conservative all the way up to our game against him. He even threw off the Patriots of all teams. They got aggressive down the stretch and it blindsided both us and NE. But in no way did they think there was a problem in our secondary. They drafted Hughes because he was BPA and there was a risk of losing Waynes at the end of his rookie deal. Brown is a tough sell for me. Typical diva WR with a lot of talent but no class. He would class immediately with a guy like Thielen and likely be a headache for Zimmer and Cousins as well. If the Vikings were needy at WR it might make sense, but they're set. I don't see any need to take a chance on a guy like Brown disrupting team chemistry. There is no reason to even think about acquiring AB, we don't have enough O line talent to give Cousins the time to get him the ball downfield any way. LOL, a tremendous play. The receiver FELL DOWN. It was an easy pick and easy return. Just because our CBs cant make a pick doesnt meant its a 'tremendous' play when one of them does. And his play to break up a play in the endzone was pure luck. The QB was at least a full second late in throwing that ball. Yes they do but it's still a bit of a concern isn't it? Plus it's a long recovery time. So there is a ? regarding the injury.